Self-compacting Concrete Market size was more than USD 20 billion in 2016 and will witness 5.3% growth during the forecast span. Positive growth indicators in the construction industry in MEA is another major factor which is likely to make effective contribution to the self-compacting concrete market size in the near future. It is majorly due to growing population and rising concern to boost economic growth in the region which will subsequently help attain significant gains to industry size over the forecast spell. For instance, as per the Centre for Economic and Business Research, the population of GCC rose by 20% in 2017 which will further augment construction industry in the region which in turn will boost industry size during the forecast span.Rapid industrialization primarily in Asia Pacific has led to strong growth in construction industry which has subsequently propelled concrete demand. For instance, construction industry in Asia Pacific is projected to grow at a CAGR of 7% in the coming years which in turn will have positive impact on the self-compacting concrete market size in the near future. Self-compacting concrete mixture has high flowability owing to its weight which can fill the formwork in the presence of impenetrable reinforcement, without the need of vibration, along with maintaining homogeneity. Product is rapidly gaining momentum in the building & construction industry chiefly in Asia Pacific which will help attain promising gains to the self-compacting concrete market size over the projected timespan. In addition, consistent technological advancements in the building & construction industry to attain low yield stress which will eventually help improves the overall performance is likely to make noteworthy contribution to the business size in the coming years. High raw material cost compared to conventional concrete is likely to hinder the overall self-compacting concrete market size in the coming years. In addition, limited product use in restricted areas in the infrastructure industry is likely to impede the overall business size during the forecast span. However, evolving construction industry in LATAM, MEA and Asia Pacific along with engineering advantages and product aesthetics will generate plentiful opportunities to the business size over the projected timespan. Fine & coarse aggregates raw material for self-compacting concrete market size captured the highest industry share and is anticipated to grow at a CAGR close to 6% in the coming years. This is attributed to the fact that it constitutes a major chunk of the overall product composition. Fine aggregates constitute crushed stone or natural sand which represent particles smaller than 3/8’’ whereas coarse aggregate is chiefly gravel or crushed stone comprising of particles ¼’’. 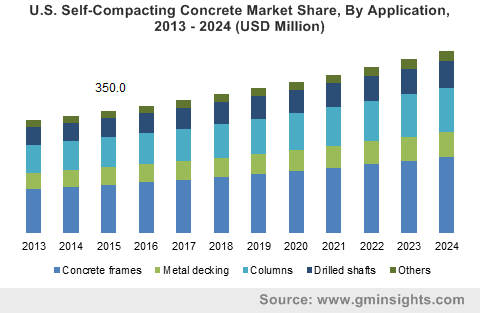 Self-compacting concrete market size for combination attained the highest industry share which is likely to grow at a CAGR close to 6% in the coming years. This is formed using relatively smaller amount of viscosity agent in concrete with significant powder content. The powder quantity varies from 450 to 550 kg/m3. The addition of viscosity agent effectively balances moisture fluctuations during the manufacturing process of concrete blocks which is a major factor likely to make substantial contribution to combination self-compacting concrete market size in the near future. Self-compacting concrete market size for concrete frames is likely to grow at a CAGR close to 5.5% in the coming years. This is due to widespread product applications in multi-story reinforced concrete frames owing to their congested structural element. Product possess unique properties which offers inherent ability to flow under its own weight and fill congested sections, hard to reach areas and complicated framework which will help attain promising gains to the concrete frames segment of business size over the forecast spell. Self-compacting concrete market size for oil & gas is likely to grow at a CAGR close to 4.5% in the coming years. This is majorly due to product use in drilling activities to recover reserves. In addition, product also finds wide-ranging applications in setting up pipelines to transport crude oil and refined oil from one place to another. Rapidly growing need for energy across several end-user industries including transport, power generation, industrial, etc. has been driving oil & gas industry which will subsequently has positive impact on the business size in the coming years. MEA self-compacting concrete market size is the fastest growing segment which is anticipated to grow at a CAGR close to 5.5% in the near future. This is attributed to rapid advancements in the construction industry in the region which is due to rapid population pace consistent efforts to boost economy. For instance, Saudi Arabia has come up with an investment of over USD 500 billion project to build a mega with the goal to diversify its economy which will have a positive impact on the industry size over the projected timeframe. 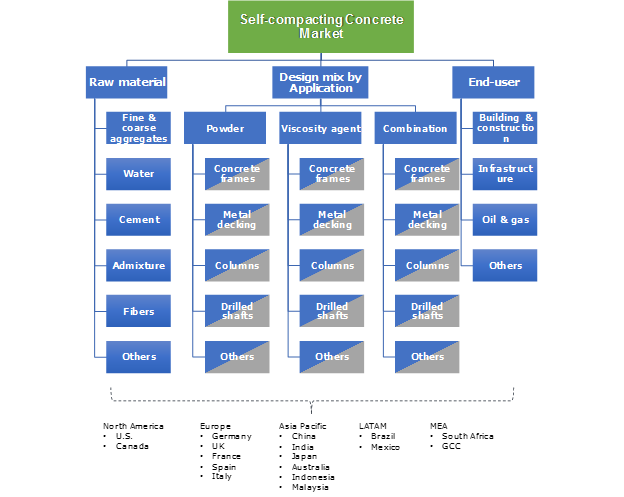 Some of the major self-compacting concrete market players are Unibeton Ready Mix, Ultratech Cement Ltd., Tarmac Trading Ltd., Sika AG, LafargeHolcim, CEMEX, BASF SE, Gilson Company, Inc., ACC Ltd. and Breedon Group. Prominent market share contributors are actively engaged in forming strategic alliances to expand its presence globally and to attain competitive advantage in the industry. For instance, in October 2017, Tarmac acquired ScotAsh’s 50% share to become the largest producer for construction materials in Europe which will help expand its presence in the region. Self-compacting concrete is a kind of mixture which has high flowability due to its own weight which can fill structures completely in the presence of dense reinforcement, without the need of vibration, whilst maintaining homogeneity. This technology has lower yield stress, no labor cost, vibration-free and moderate viscosity. It is primarily formed from cement, aggregate and water. Positive growth indicators in the building & construction and infrastructure industry primarily in Asia Pacific and LATAM are the major contributors which will help attain promising gains to the overall self-compacting concrete market size in the coming years. In addition, growing oil & gas industry in the U.S. which is attributed to large amount of unrecoverable reserves will result in growing drilling activities which will eventually propel self-compacting concrete market size over the projected timespan.